We are a family that plays outside a LOT in winter, and warmth is imperative in the outdoor clothing we purchase. We've gone hiking and skiing when it's been as cold as -20 or -30 Celsius so we take our winter gear seriously and we don't mess around with quality. When we dress for winter outdoor activities, we focus on three layers of clothing.We start off with long underwear or non-cotton base layers, add a second fleece or wool mid-layer, and top it all off with an outer layer consisting of a warm jacket and insulated waterproof pants. Base layers are easy and we aren't all that fussy over which brand we wear. While I'm partial to Columbia base layers, my husband will wear any non-cotton base layer set, and my son makes do with a very affordable set of base layers from MEC. Outer layers are also relatively simple. There is no "best" jacket or set of ski pants. We are partial to one-piece snow suits for kids from Ducksday, but most snow pants and jackets will keep you warm if you have good base and mid-layers. Choosing a good mid-layer has always been the tricky part of the layering process in my mind. For myself, I don't usually bother with a second layer because I wear quality long underwear and then just make sure my outerwear is super warm. It makes things easier and I don't have to worry about overheating as much. Children are different though and my son usually needs that extra layer between his long underwear and his snow suit. In previous years, my son's middle layer has always consisted of a fleece sweater and a pair of fleece sweat pants. And it has worked just fine. This year though, we are trying out something new on the bottom and so far I'm extremely impressed. The product we're trying out is a thick, warm unisex pair of wool pants called TUBES that have been made by a Norwegian mom from the United States. 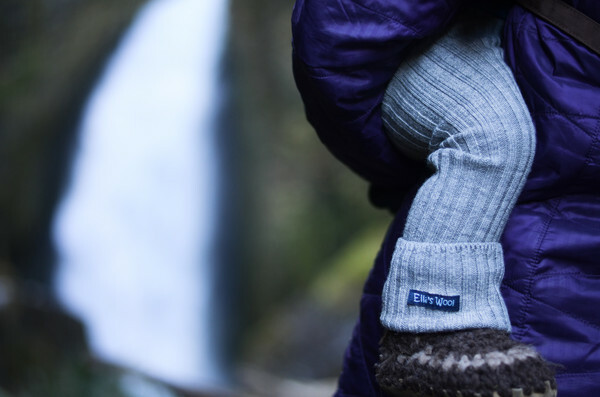 Ella's Wool was established in 2012 out of Becca's mission to try to get kids to play outside all year, even during the “indoor season.” She's passionate about finding a way for children to stay warm in cooler climates and her son loves his TUBES so much that he wears them every day. I love that these pants are made of high quality wool that's super comfy to wear without being itchy. My son wears them as a mid-layer so they are not directly against the skin, but he has still never complained about being itchy or uncomfortable. He has worn them for upwards of 8 hours without ever saying he was too hot or begging to take them off. I don't even think he notices he has them on. We recently spent a weekend at a backcountry hut and my son wore his TUBES all day long until it was time to change into his pjs. He wore them while snowshoeing and sledding outside and then he wore them in the drafty hut over his polyester long underwear while playing games and running around. He was even wearing them in a game of "Yoga," otherwise known as "Twister" and showed great flexibility and range of motion in them. "Wool is not only suitable for freezing cold winter days. In fact, it’s a naturally heat regulating fabric, meaning that you can wear your merino garments in any weather conditions and be sure to feel perfectly comfortable. This is one of the reasons why wool is recommended for babies, since they are unable to express whether they’re feeling too cold or too warm." We appreciate this with our son who will rarely tell you if he is too hot (despite being 6.5 years old.) And I can definitely tell that the TUBES feel comfortable both inside and out based on our recent experiences with them (as mentioned in the previous paragraph.) Children can wear the wool pants outside and then just keep them on afterwards without overheating or sweating to death. These TUBES perform when you most need them. I've pulled my son's ski pants off a couple of times now to find him practically radiating with heat. I can only imagine how warm he'll be when it gets down to -30 and he has to ski into a backcountry cabin this winter. There is no way he will ever complain about being cold this winter. Visit Ella's Wool Website to find out more about this amazing product and to purchase a pair for your child this winter. The site has a great section that explains "Why Wool." The pants are a little expensive at $79 but they are designed to last more than one season. The pants are stretchy and they roll up at the bottom so that they can grow with your child. And don't worry if you buy a pair and immediately think "these will never fit my giant 6 year old!" - That was my first thought. They really do stretch and I promise they don't fit like tights. Boys will feel quite comfortable in them and they offer great range of motion while wearing them. My son is wearing the 5-7 size and I would expect a family to get three seasons out of the TUBES. Wash them gently with special laundry detergent for wool, and you should be able to pass them on to a second child. Follow this link for more info on the TUBES pants, sizing, and to order a pair. Disclaimer: I was given a pair of TUBES for this review but all words and opinions are my own. This story was not sponsored or paid for. These look perfect for snowshoeing or cross country skiing!!! Can't beat wool for warmth! I love this idea. So nice that they are stretchy wool! Oh and he will be sitting in his sled while I'm skating with him. General outdoor play. It doesn't snow much hear but it is very windy and cold. Thank you so much for talking about kids layers! I didn't grow up with cold weather so it is frustrating to figure this layers things out sometimes. You mentioned the one piece snowsuit for you son. Does he wear this to school as well or do you have a 2 piece for that? I'm wondering if it takes longer of him to put it on or take it off in the classroom? The Tubes would be great for my kids when sledding or skating outside. My son just takes a cheap pair of ski pants to school. I don't like sending him in any of his good clothes to school. One winter he ripped a huge hole in his expensive down jacket. Now he gets Walmart clothes for school. :) But the one piece snow suits are easy to put on and he could likely get into it faster than a two piece set. These look great for anything. And they don't look bulky either. I'd love to put these on my daughter for playing outside and learning to ski! Downhill, Cross country skiing and winter hiking. My kid would use them when we build a snow hut in the back yard! My kids were so excited to see snow for the first time today! Skiing, skating and sledding are all on our to do list, hope Calgary gets some more snow soon! Rolling around in the snow. Wow - these sound amazing! Last winter was the first year we spent long periods of time outside with the kids (finally, we had no infants!) and have struggled to get the right combination of clothing for warmth without overheating. Our favourites are skating at outdoor arenas and tobogganing, but we hope to start the kids x-country skiing in a year or two! My daughter would go tobogganing while wearing them. Definitely x-country ski. I've seen these pants elsewhere and wondered about their efficacy. Thanks for the review! We are waiting for snow here in Maine so we can pull out our cross country skis! These would be so awesome for one of our girls! These wool pants would be a staple in the sandbox adventures... all winter long. Would be great for anything outside that we do in the winter!